Although the Germans hound with their tireless will to seek and their excellent security have always been run as hunting dogs, but they are also affectionate, sensitive and nature-strong contemporaries. Due to their sensitive nature, they need close and frequent contact with their handler as well as sufficient employment and affection. In addition to keeping the kennel, the bracken are also very good to keep in the house thanks to their quiet nature, because they are characterized by cleanliness, loyalty, vigilance and children's love. The grooming of the Germans hound is not expensive. Germans hound has a particularly strong urge to move, which should be absolutely satisfied in order to keep them balanced and healthy. The daily spill is therefore essential. With her fine nose, her iron will to track and a good sense of direction, the passionate, persevering beagle is very well suited for forest use. 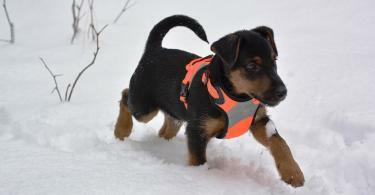 The German hound is an excellent companion dog, but the breeding goal is still the hunting use. German Bracke are used primarily in the field of "lute hunting", for the lurid browsing for sow, hare, fox, and rabbit in low-deer forest areas. In addition, the pursuit of hoofed game (welding work) and the lost bringing of rabbits, rabbits and smaller wild deer to their skills. The Bracken are an ancient German hunting dog beat from the time of the Teutons. Even then, the bracken were used for hunting. Later, the breed spread in Scandinavia and the Alps and even reached overseas. Of the once numerous Bracken breeds in Germany only the Westphalian Brackel has been preserved, which produced its most important local impact - the Sauerland Holzbracke. Finally, the fusion of the Sauerland with a local Steinbracke a unit type, which has been officially known as the German Bracke since 1900.
ick tail. The coat is for a short-haired dog rather long, very dense and hard - the stomach side is densely hairy. 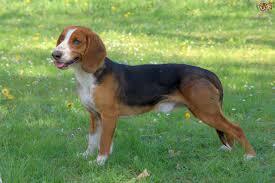 The German Bracke is bred in three colors and has red to yellow hair with a black saddle. In addition to a continuous paleness are a white catch with neck ring and a white chest, white barrels and rod tip her trademark. 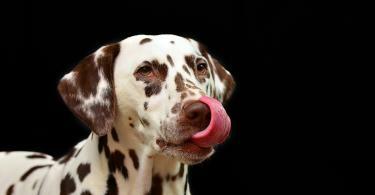 The head of the German hound is narrow with 21 cm length and elongated with a slightly arched head and a small heel. The bridge of the nose is almost straight. The nose sponge has a bright, almost flesh-colored strip over the middle, while the nostrils are rather dark pigmented. 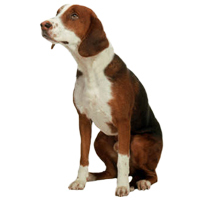 The hound has a very strong teeth, clear, bright and friendly eyes and well-fitting, rounded and hanging ears. The moderately long, but relatively strong neck goes into a deep chest, which extends to below the elbows. Her back is only slightly arched, the croup slightly knocked off. The long bushy and very hairy rod for protection against the beating against trees is worn slightly hanging. The forelegs of the bracken are very well formed, tall and almost straight, while the hind legs are not very wide, long and well angled. Thick paws with closed toes and a large, solid bale allow the hound a good kick.